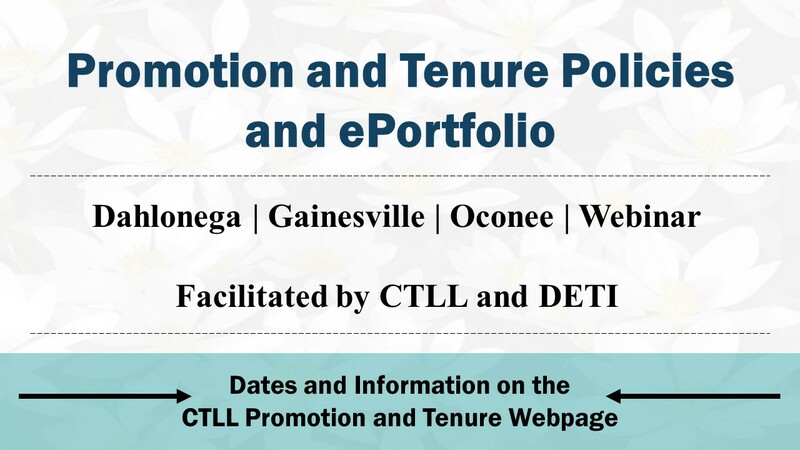 CTLL & DETI are offering Promotion and Tenure Policies and ePortfolios workshops on Dahlonega, Gainesville, and Oconee campuses. 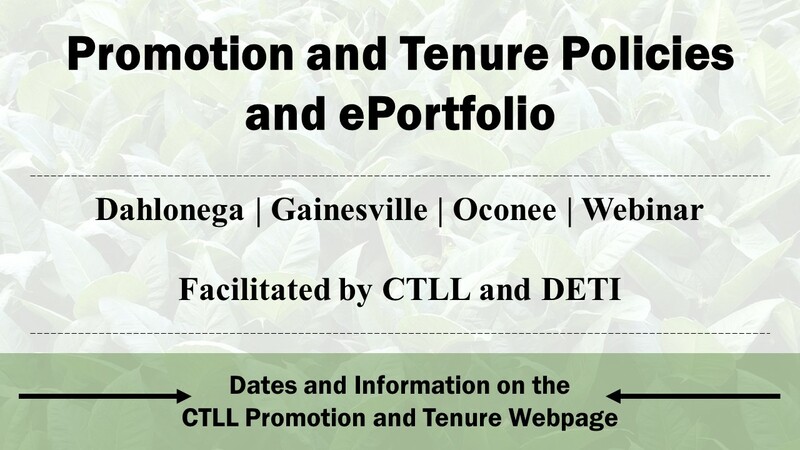 Mary Carney and Irene Kokkala will provide an overview of UNG policies and technology. 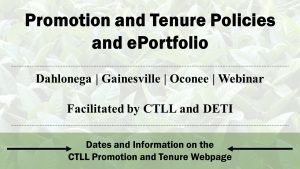 CTLL & DETI are offering Pre-tenure Policies and ePortfolios workshops on Dahlonega, Gainesville, and Oconee campuses. 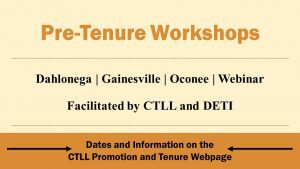 Dahlonega Campus | LTC 380 | 12:00 p.m. – 1:30 p.m.
Gainesville Campus | Nesbitt 3203 | 12:00 p.m. – 1:30 p.m.
Oconee Campus | SRC 564 | 12:30 p.m. – 1:50 p.m.
12:30 p.m. – 1:50 p.m.
CTLL & DETI are offering Promotion & Tenure Policies and ePortfolios workshops on Dahlonega, Gainesville, and Oconee campuses. 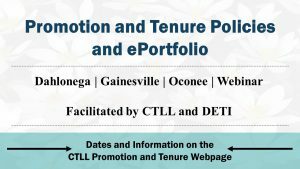 Mary Carney and Irene Kokkala will provide an overview of UNG policies and technology. 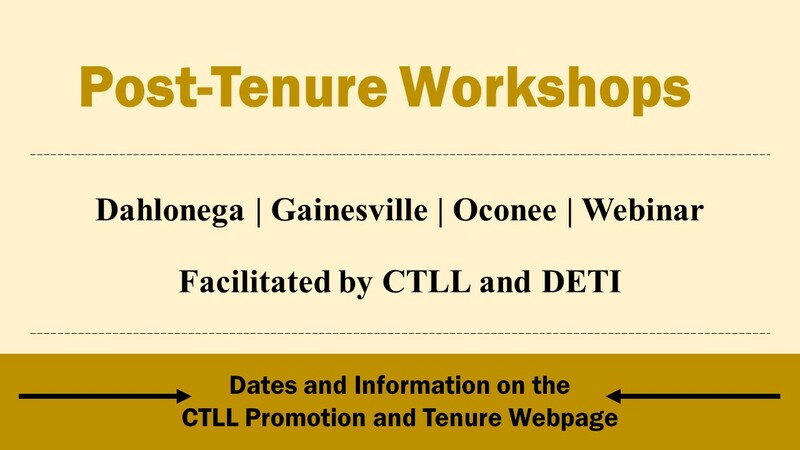 Please note that the website lists the incorrect time, the correct time for the December 5, 2018 webinar is 12:00-1:30 p.m.
Dahlonega Campus | LTC 380 | 12:30 p.m. – 1:50 p.m.
Gainesville Campus | Nesbitt 1203 | 12:30 p.m. – 1:50 p.m.
CTLL & DETI are offering Post-tenure Policies and ePortfolio workshops on Dahlonega, Gainesville, and Oconee campuses. Oconee Campus | SRC 501 | 12:00 p.m. – 1:00 p.m. 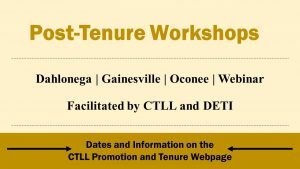 Please do not fill out a registration form for this event. 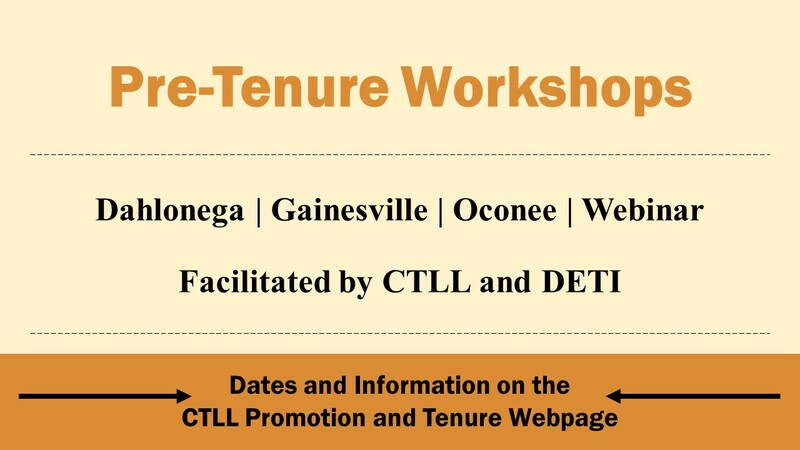 To register for this webinar click here.